June is Migraine Awareness Month! Today is day 5 of awareness month inspirations. 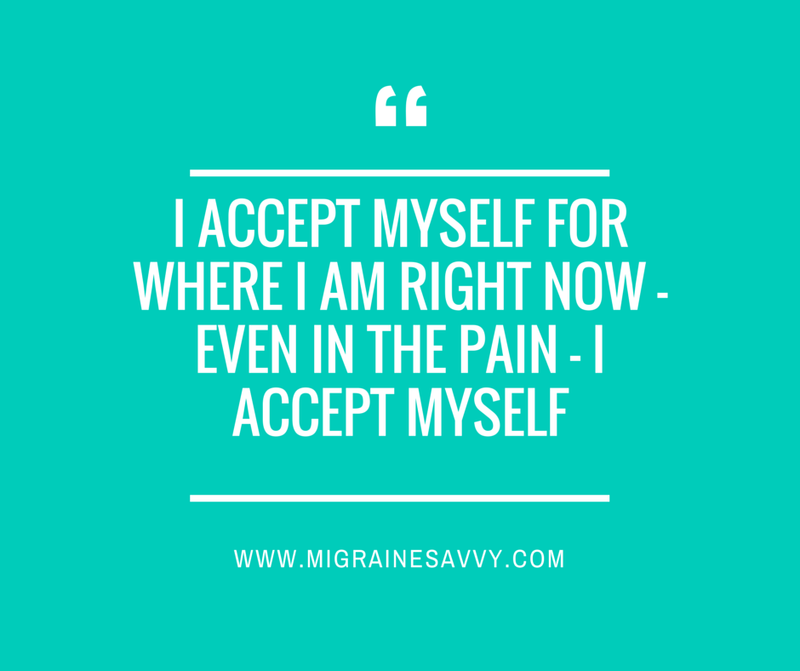 The title 'I Accept Myself' sounds easy - but sometimes when migraines get us down it is really hard to stay positive. So many of us suffer from depression too. How could we not. This illness (I hate calling it that as I am totally well except for the migraines) can destroy everything we have worked for and then some. Take some time to allow yourself a few minutes to just accept the pain. It is in your life but it does not have to control your life. It is not who you are, what you believe in, or what you stand for. Now just a little side note here. Remember that the experts say that you should leave off any negative words – so your affirmation to use daily would be “I accept myself for where I am right now.” I just can't help acknowledging the pain and the migraines, I feel better when I am real. But let's practise positive statements. Build Your Own Migraine Tool Kit - Here is my article with eleven steps on exactly how to do it yourself! It has all the forms you need to print out and step by step instructions to navigate your way through effective chronic pain management. Timing is everything when aborting a migraine attack. Wild Divine Biofeedback is an essential part of keeping my migraines at bay. Learning to control breath and body temperature could assist in reducing migraines or eliminating them all together if they are stress related. Meditation is proven to help reduce migraine attacks. This system will teach you all of that. I love mine. Dr. Amy Myers Elimination Diet eCourse is much easier than doing it yourself - like I did. It is vital to find our migraine food triggers, and avoid them where ever possible. Dr. Myers is an autoimmune expert. Just what we need! This e-course will guide you every step of the way. Migraines and Food is so important to me, especially after spending four years studying Chinese medicine, and a few more studying nutrition. I can choose what I put in my mouth. I can be proactive and help my body with nutritious foods and staying hydrated. I have a whole Migraine Food section, that I hope you enjoy. Remember that your contribution will help others too! We are not in this alone, even though it feels like it most of the time. Our stories and input can help each other. For example, I heard about Naramig from a client of mine, not my doctor or any of the specialists I had seen! Two years after triptans came on the market. Two years of needless suffering. This is a safe place to share your challenges and tell your story to people who truly understand what you are going through. Share your art to inspire us all in our time of need. Find solutions with new treatment ideas specific to migraine disease, and get some professional health advice from others that walk this path. Just click on the links underlined above if you would like more details. Please click here if you have anything you want to share with us this month in our Facebook comments box. Did you know that I offer telephone counseling around the world via Skype video or via telephone? That's right, from the privacy and comfort of your own home you can get professional counseling from me. I am not sure if you know this about me, I have a Masters Degree in Counseling and Applied Psychotherapy (MCAP). I have been counseling people for over 16 years. I would love to be of service where I can. I have an online booking system to make it easy to schedule a session over different time zones. So, you can contact me anytime on-line, book in 24/7, and we will talk as soon as possible. Please share this with your friends and family. It’s time to spread the word about Migraines and educate our loved ones! They can click on this link to join the mailing list as well.